If there’s one thing we all thought the future would bring, it’s almost certainly shoes that lace themselves automatically. After all, just about everyone has seen Back to the Future and the iconic shoes featured within. 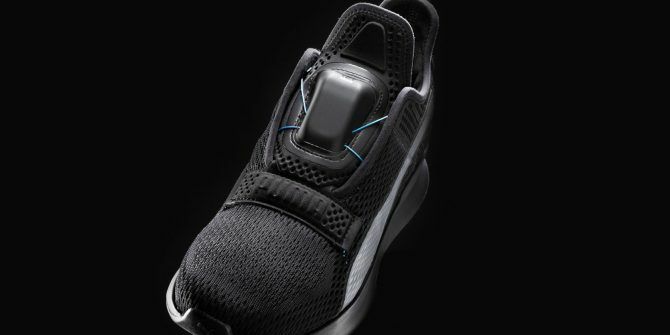 Well, popular athletic shoe company PUMA is actually jumping feet first into the self-lacing shoe market with its newly-announced Fit Intelligence shoe (Fi). Of course, Nike already released the Hyperadapt shoes that tie themselves, so PUMA is not the first. Still, these shoes sound like they’re packed with futuristic features, and they definitely seem worth a look… Though the price might shock you a bit. PUMA just unveiled these high-tech shoes today in Hong Kong, and they sound rather interesting. The main feature is the fact that the shoes don’t require you to lace them like a traditional pair of shoes would. Instead, they feature a cable that runs through the upper portion of the shoe. Once you step into the shoe, you swipe up on the small module, and the shoes tighten around your foot. According to PUMA, the shoe actually features a proprietary system that learns the shape of your foot and tightens accordingly. Of course, we’ll have to wait until we get to try a pair for ourselves to see how well this works and how comfortable they are, but it all sounds very promising. You won’t need to rely strictly on the shoe’s reading of your foot, as there’s a smartphone app that lets you tune the fit to your preferences. After all, shoes are definitely not one size fits all. There will also be support for Apple Watch, which will allow mid-run adjustments without taking your phone out of your pocket. To remove the shoe, you simply swipe down on the little module on the front, and the laces will loosen, making it easy to slide your foot out. How Much Will the Fi Shoes Be and When Are They Out? Unfortunately, anyone waiting for the future of footwear from PUMA is going to have to be patient, as the shoes aren’t expected to release until spring of 2020. We’re more than a year away from getting to experience the joy of never tying our shoes again. As for the price, PUMA announced that the shoes will be available for $330 a pair, which puts them slightly ahead of Nike’s upcoming model, which will retail for $350. Can’t get enough of the future? Check out these smart home gadgets that’ll make your whole home feel like it’s in the future 5 Smart Home Products Worth Every Penny 5 Smart Home Products Worth Every Penny While some smart home products are just gimmicks, these are awesome and worth every penny. Read More .